All that stands between the Dave Murray Downhill and Olympic perfection is about seven degrees Celsius – that’s the temperature drop required to take the current valley conditions (El Nino special) to cold enough to turn a water-logged course into boilerplate ice. 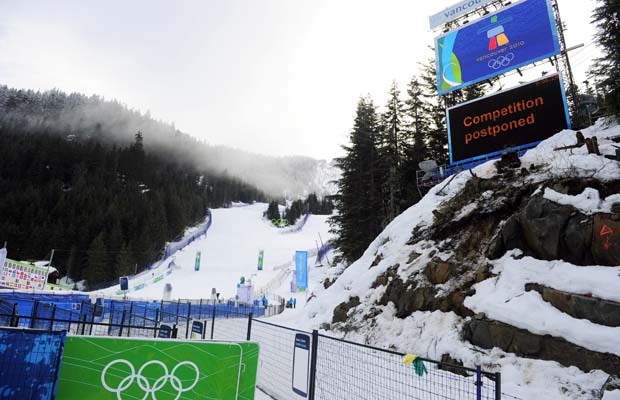 “This course is excellent,” FIS men’s race director Guenter Hunjara told a small gathering of media at the base of Whistler Creekside just before 11:30am Saturday morning, the original start time for the men’s downhill event. “It’s just soft.” Too soft for downhill racers posting 80 mph speeds, after a night of mild temperatures, wet snow and light rain, which prompted the rescheduling of the men’s downhill until Monday 15 February at 10:30am. More than 200 crew spent the night boot-packing the mid-section of the course from Fallaway down after wet snow fell overnight. More Weasel Workers were tirelessly prepping the women’s downhill for a training run on Sunday that seems unlikely to run. In the meantime, with everything that is humanly possible having been done, officials admit it’s a wait-and-see-game. “Everything in the hands of Ullr?” I asked Chief of Race Darrell MacLachlan this morning. Ullr, it seems, has turned his attention to the top of the mountain, which has been dumped on with fresh snow. Athletes from various national Olympic teams made the best of it today, getting some face-shots in before race day, whenever that may turn out to be. Looks like Ullr and El Nino are battling it out. Here’s hoping Jack Frost blows into town to bust up the fight.